We are seriously considering supplementing our math cirriculum with your program. Our private school operates under the ACE self-taught pace program. We are in need of a teaching tool to help our children better understand what is being taught in their paces. My one concern is how your program works using multiple students. Some programs have a limit to how many students can access and complete the program at which time you have to re-purchase the program. Is this a program that can be used an indefinite amount of times, or does it expire after so many uses. You make a one-time purchase of a license for a specific number of computer stations. An unlimited number of students may use the software on the licensed computer stations. You may want to increase the number of computer stations in the future for which you will only pay the difference. Every year to eighteen months, we upgrade the software to accomodate new operating systems (Windows/Mac) and we usually enhance the programs in ways that have been suggested from our software users. The cost of the upgrades are generally 25% the cost of the original software. Tech support is rarely needed yet is always available and always free. If you would like a written proposal for your specific needs faxed to you, please let us know the titles which are of interest to you, the number of computers which will be running the software and your fax number. On what foundations were these curriculum units developed? The curriculum is based upon the State Standards of California, Illinois, and Massachusetts. Where does a student start? The programs are flexible. You may use the programs for an individual student focusing on specific weaknesses or missed math topics OR work with all your students together in a lab situation on a specific topic. For instance, if you know from students' standardized tests that they are weak in Fractions, have them take "Fractions - Test A" -- the test will be scored and their weaknesses will be indicated on a screen which resembles the MENU screen - Print that page and keep it in a file for each student -- We recommend all score sheets should be printed -- makes a great visual on "Parent-Teacher" night! Based upon the analysis from Test A, students go to the learning sections of the program and practice their weaknesses. After the student works on his/her weak areas from the body of the program, they should then take "Fractions Test B" which is only accessible from the Fractions folder on your C:\ drive (for security purposes). All scores are recorded and stored on the included Learning Management System. I have some VERY low kids that need the help... for example... a 14-year old boy who can't do addition with carrying. The 14-year old who can't do addition should take the review sections of "Number Sense" -- see if he has gaps in "skip counting". Have him do sections (05), (10), (15) of "Number Sense". If he scores well enough, then move him into the "Addition" program. Are the activities sequenced (set order in which they must be delivered)? The lessons are sequenced for those students needing the "order" but flexible enough to be used on an "as needed" basis. 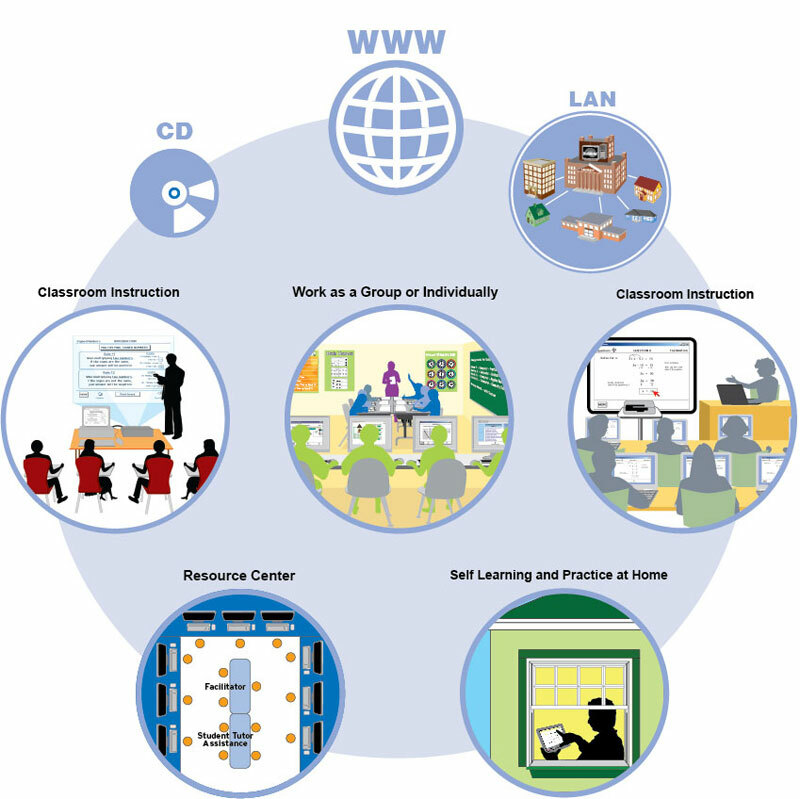 How do you accomodate for students' learning styles and ability levels?Do the programs offer multiple points of entry for learning? Menu selections offer multiple points of entry. Worksheets accomodate the written learning style and a variety of perspectives are offered for each learning topic. For instance, multiplication of whole numbers is taught in a many different ways and practiced differently to gain perspective on the concept. In algebra and geometry, problems are explained using different methods. What techniques do you utilize in your program to ensure curriculum topics are exciting and meaningful to students? Positive encouragement and reinforcement provide the "coaching" students need to keep going and keep challenging themselves. Students are encouraged to work 20 minutes per day, but most want to work much longer. Do you target a certain population (gender, ethnicity, individual vs. family, school, age, etc)? No. This software is for everyone and to be used anywhere at anytime. How do you know which child took which quiz? The database in the program folder will list the section number and the name of the assessment along with the student's last name, first name, date, time, and score. You may want to add additional data, such as teacher's name or student's birth date or codes that may be specific to your school setting. Does it ask for their name each time they take an assessment? How long does each module take to complete? Each title (such as "Number Sense" or "Fraction Basics" or "Algebra - Chapter 1") contains about 15 sections. Each section is intended to be completed in 30 minutes -- some students finish more quickly and others take longer. The comprehensive tests at the end of each title may take students up to an hour or more to complete. For students who work more slowly, we suggest that these concluding tests be printed, worked out by hand over a period of time, and when completed, the student goes to the computer and enters all the answers for their score. Their score is automatically recorded on the included database for teacher, parent, and administrative uses. Do the practice problems change each time they go through a section? The problems stay the same - they won't remember them anyway, if they've done other sections and a review in between. How do I print out worksheets? To print the worksheets in the "Arithmetic Series" - click on the "Worksheets" button from the MAIN MENU screen - this will take you to the WORKSHEET MENU. There, you click on whichever topic you want, it will take you to that topic - you can look at the problems, if you wish, or just print them - you can choose to print 1, 2, 4, or 8 screens per sheet of paper -- it is pre-set for 8 screens per page. Also is there a limit to how many students' data the program can hold or is it just based on my computer. There is NO LIMIT to the amount of data the spreadsheet will hold. How do I set up the database recording system? It is already set up. The computer will automatically score and store data. Where are the tests? Are they on the computer? Are they on paper? The tests are accessed from the main menu of each title. They are on the computer and you have the option of printing hard copies. How do I access the data after the students have taken the test? The data is in the same folder as the title of the program you are using. For instance, if you want to see student achievement for the "Fraction Basics" program, go to "My Computer", C:\ drive>Basic Math Series>Fractions>LMS (Learning Management System). EACH software title has it's own database file (For instance, you will have one data file for "Fractions", one data file for "Decimals", one data file for "Percents", etc -- you can combine these files as you wish and sort as you wish -- you just need to know a little bit about Excel to do it). Our computer lab has all different versions of Windows (95, 98, 2000, XP). Will the software work on all these different operating systems? What do you get when you purchase the product? You may download directly from our site or you may choose to receive a CD-ROM with the data, which is loaded onto individual computer workstations or onto a network driven by a server. Also, included in the packaging is a User Guide with teaching and learning suggestions, a progress chart for the teacher or student to use to keep track of their work "by hand", and instructions on how to access the data which is recorded automatically when students take an assessment. The "Arithmetic Series" contains a section of printable worksheets which mirror each lesson in the software program and can be used as class work or as homework. The "Basic Math Series", "Algebra Series", and "Geometry Series" all have printable tests with or without the solutions. The "Advanced Math Series" also contains handouts for the students which are helpful in memorizing the graphs of Trig functions and polar coordinates. Is training required? What teaching experience is required to deliver your curriculum? No training is required. The facilitator need only familiarize themselves with the point-and-click flexibility features to integrate this software into the learning environment. Although no math instruction experience is necessary, it is helpful. This is a complete self-paced learning system in which the student is a self-learner and self-directed. Concluding assessments are available for accountability and record-keeping. Staff should be able to navigate the basics of the computer (Start>Programs>Title). What amount of planning time must a practitioner dedicate to effectively deliver your curriculum? The best planning would be for the practitioners to familiarize themselves with the titles which will be used by the students. Could we obtain a review copy of your curriculum for preview purposes? Yes, we have a demo CD available to schools. Please specify Windows or Macintosh and provide us with a contact person, school name, school address, and school phone number. Most MathMedia titles are available for download from our site. All downloadable products are also available on CD-ROM upon request at checkout. Note: The download for our downloadable products will be available to you at the end of the checkout process. Due to the nature of security measures on your network, some firewalls may prevent the download from our store. If you experience difficulties while downloading, please contact us immediately so that we may arrange to deliver the software via other means. Are consumers allowed to purchase your software? The industry standard states: "Opened computer software and downloaded computer software, movies, music and downloaded music, and video games can be exchanged for the identical item but cannot be returned for a refund." The 100 pages of descriptions and sample screens on this web site are provided for our customers to research our product line thoroughly and know what they are getting before their purchase. Additionally, you may download a free demo at http://www.mathmedia.com/downloaddemo.html to get the "feel" of our product line.